Cycling is a great activity for all the family. However old you are or however fit you are, you can enjoy a cycle ride along the trailway and beyond. The trailway provides a link to many rural roads, which allow you to cycle for miles, mostly traffic free, whilst you enjoy the Dorset countryside. 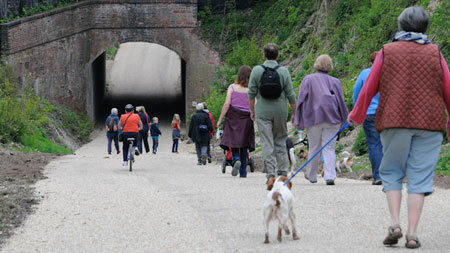 The Trailway avoids the very busy A350 and A357 roads and provides a flatter alternative. Getting to work by bike has also never been easier with the trailway. Many people use the trailway as a commuting route and, coupled with the government 'cycle to work' scheme, this number is increasing. Points to note when planning a Ride: See our interactive map on the Home page. There are links between traffic-free sections in Blandford using roads, and a short stretch on the pavement of the A350 south of Blandford TESCO, where inexperienced riders may need to dismount. Parents should take particular care of their children on these sections. Please take care that there will be other users including dogs, horse riders, children, mobility scooter users - watch your speed especially on blind corners. The surface is generally ok for racing road bikes but again care should be taken if your bike is not built for off/road use. Take a puncture repair kit and pump as you may run over thorns etc. In places the cuttings have been landfilled and there are ramps to join / leave the trackbed - care should be taken on gradients. 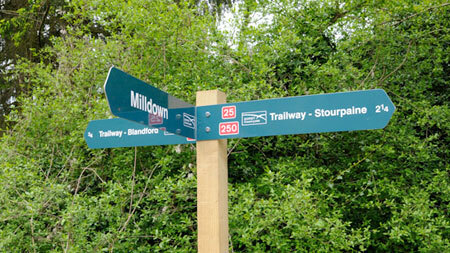 Circular Mountain Bike Ride incorporating The North Dorset Trailway, Stourpaine,and Blandford Forest. Spetisbury to Badbury Rings - extend your ride from the current limit of the Trailway to Badbury Rings - ancient British hill fort with views for miles. DCN is the county's cycling campaign, founded in 1992 and now having over 1,300 members. We try to get local authorities and other organisations to provide safer and better facilities for all kinds of cyclists, especially those who use bikes for their daily routine such as shopping, going to work or school, local visits etc. Since its inception, DCN has helped to get safer junctions, new routes, more cycle parking, cycle training and more people on bikes. But there is much more to be achieved before we approach anything like conditions in Holland, Belgium, Denmark, Germany and some parts of France. The campaign needs to continue and gather strength. There are branches of DCN in most Dorset towns, each one lobbying in the light of local conditions and coordinated by an elected chairman and committee. DCN Coordinators and county officials all work voluntarily. We are affiliated to national organisations such as CTC, Sustrans and Cyclenation, and have useful links with Dorset Wildlife Trust and the Environmental Transport Association. Dorset Cyclists' Network's website has details of cycle dealers, routes, insurance and other useful information for cyclists, and details of all our contacts can also be found there. To join DCN and support the campaign costs only £6.00 a year for the whole family at one address. The more members we have, the more influence we can bring to bear, so why not join us now? Your subscription could be repaid very quickly by the discounts DCN members get at nearly every cycle shop in the county!